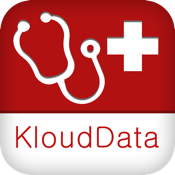 KloudData mobile-MedRecords (mMR) manages, stores and displays entire clinical information of patients in real time at the point of care. mMR helps you enhance patient care process with point-of-care access to end-to-end patient records – from a variety of backend data sources. This helps improve patient care metrics and overall patient outcome. mobile-MedRecords is an easy to extend and secure wireframe platform that can seamlessly integrate with other existing HIS/HMS. mMR is a foundation app that is pre-loaded with healthcare-specific content, hence is consistent yet highly adaptable. • Initial Assessment-View patient demographic details with Diagnosis. • HAI Assessment-View HAI assessment of the patient. • Laboratory-View patient investigation results - also request for new investigation. • Radiology-View patient radiology results like x-ray, CT scan image and such - also request for new radiology investigation. • Notes-view previous notes by consultant & add notes with date and time stamp. • Prescription-Doctor can prescribe medicine on device to reflect back into pharmacy module. • Discharge Summary-Doctor can create discharge summary and request for patient discharge with one click.